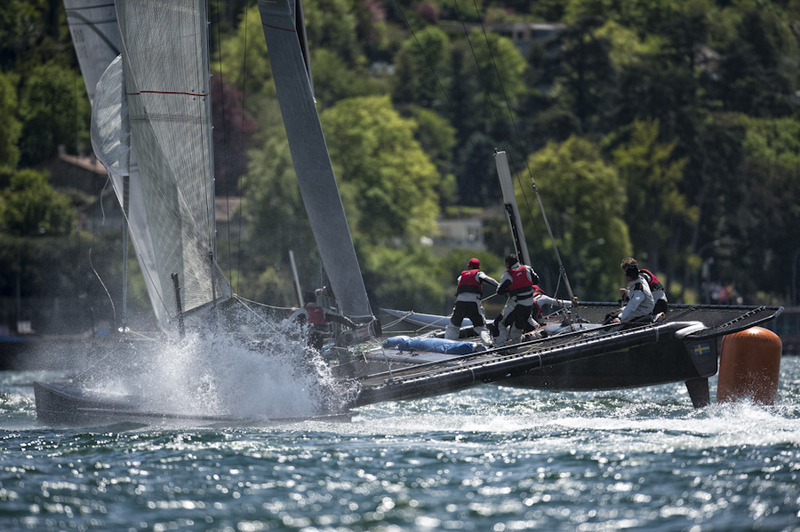 Today was the final day of a great weekend of racing on Lake Geneva. We sailed four great races to go with the previous ten, for a total of 14 races. The winds today were again in the 10-12 knot range with gusts to 16 at times. Artemis Racing had a pretty good day with scores of 5,2,5,6 and held our third place overall. We were pretty pleased with that result considering we did very little training as a complete crew prior to the regatta. Alinghi and Realstone ('the kids') tied for first place overall, but Alinghi won the tie breaker due to having more first place finishes. Alinghi won the last two races of the weekend, while the kids finished 7, 3 and thus closed the gap and forced the tie. Realstone is known as "the kids" as the crew are all about 23 years old or younger and they train a lot. They trained for two months in the D35 prior to this weekend and it showed. Very smooth on boat handling and they know the lake pretty well. We were just two points ahead of Lady Cat this morning so we were happy to extend that gap to eight points by the end of the weekend. The Southwesterly wind was shifty as always and in the last race there were some very large "holes" of no wind. There was so much passing and being passed that I can't possibly recount it all. Suffice to say that it was never over until you crossed the finish line and often boats made big comebacks after being last after the first lap. I want to thank Yvan, Frank, Gilles, Sarah, Noel and Maxime for a great job this weekend. Fourteen races is a lot and the wind was up so the crew work load was high and everyone put in 110%. Catamarans are fast and fun but also a lot of work. Sailing a D35 with six gives one a good appreciation for the AC45 which is sailed with just 5 crew and the AC72 with its 40 meter wing which will be sailed with just 11. The next event for the D35s is Le Grand Prix de Crans in three weeks time. 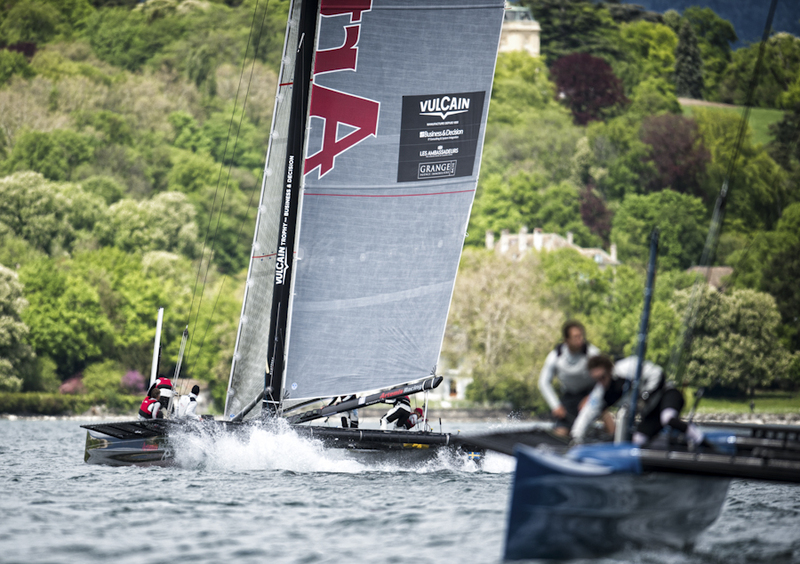 Before that, we have the AC45 World Series event in Venice in 10 days. I am back to Valencia tonight to the Artemis Racing base of operations.